Did you know you can now order your Just Eat takeaway from Mezcal Cantina here on View? Mezcal Cantina is a Mexican bar and restaurant serving authentic food and Latin American cocktails. Mezcal Cantina also hosts regular events. 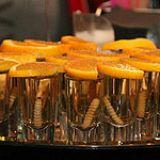 What did you think of Mezcal Cantina? I recently popped into Mezcal Cantina for a quick bite while passing through Dalston and was very impressed with not just the friendly welcome I received but the tasty Tinga Chicken as well. Themed Mexican bars may be fun but they are almost always cheesy. Unfortunately, Mezcal Cantina veers into being just a bit too cheesy, although you certainly can’t say you’ll have a dull time here. Mezcal Cantina couldn’t be more Mexican-themed if it tried. 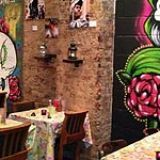 Located on Kingsland Road, it’s the sort of place you head to for a big birthday when you fancy easy grub and lots of tequila. 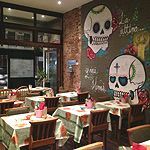 The décor is a mix of east London exposed brick covered in graffiti-style paintings showcasing Day of the Dead imagery in an array of funky designs. It’s just a shame, therefore, that they have mixed this with clichés like cacti and sombreros. It’s fun, certainly, but it’s just a bit try-hard for what is one of the cooler parts of London. Still, if you don’t take yourself too seriously you can’t help but chuckle at the over-the-top effect of it all. This bar and restaurant certainly takes its theme seriously, occasionally pushing the boat out with blindfolded piñata-bashing or dudes with guitars playing loud Mexican tunes. 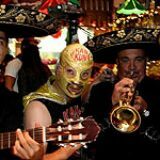 If you hate that sort of thing then steer well clear of Mezcal Cantina, but if you’re having a party with your mates and you’re looking for embarrassing Facebook photo opportunities then you may just get into the swing of things. Once you get over the embarrassment, it’s actually kind of fun. There's quite a large menu at Mezcal Cantina, offering an array of Mexican grub that is easy to share and dip in and out of. It’s not the best Mexican food available in London but it is very well priced. For example, the quesadillas are just £4.95 and are packed full of creamy cheese, spicy chicken and various hot sauces. It’s tasty enough, even if it’s not touching the outer reaches of gastronomy. Better are the huge sharing plates of tacos (£12.50), covering a range of options from veggie beans to pork and fish. Again, it tastes good, but it’s just not hot enough, being toned down for typical Western palates. If you’re heading here just for drinks then you’re better off ordering a big bowl of nachos. The drinks menu at Mezcal Cantina is actually pretty good, with a nice combination of tequila or mezcal cocktails (if you can’t face it straight-up). They also offer a range of spirits that you can’t readily find elsewhere in London, which is a nice touch. 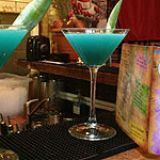 Mojitos are well priced between £7 and £8 and there's an exciting twist with the Spiced Vanilla Mojito - it's sweet with just a hint of fire, balancing the cocktail well and making it a bit too easy to drink. Of course, you can’t visit a Mexican bar without exploring the Margarita menu. These are priced between £5 and £6 and are so strong they will blow your head off. The Berry Margarita adds fresh berries to the mix so it’s a little easier on your throat as it goes down, with a slight underlying sweetness. Sometimes London bars and restaurants take themselves too seriously. Mezcal Cantina certainly can’t be accused of this with its fun take on the Mexican scene. Visit with a big group of friends who aren’t afraid of mezcal, tequila and equally strong cocktails.